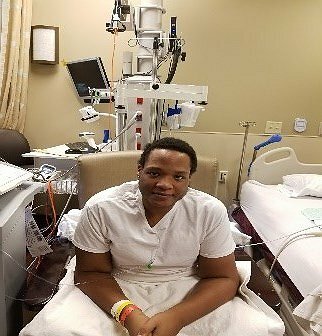 Nehemiah is 23 years old and after years of struggling with cardiomyopathy he needs a heart transplant. The heart transplant is the last option for Nehemiah to have a healthy normal life. Presently, he is connected to a balloon pump which helps to support his heart. He lives in the hospital and cannot come home. Waiting for a heart transplant and the financial cost of the transplant can be overwhelming. To help offset such expenses, a fundraising campaign in Nehemiah’s honor has been established with Help Hope Live, a trusted nonprofit organization that has been providing community-based fundraising guidance to patients and their families for more than 30 years. All donations are tax-deductible to the full extent allowed by law, are held by Help Hope Live in the North-Central Heart Transplant Fund, and are administered by Help Hope Live for transplant-related expenses only. If you would like to make a contribution, please click the DONATE NOW bar. Nehemiah goes to Kansas City on 2/18/17. By the help of the Lord he needs your prayers continually. You know his dad died on December 22, 2016. The Lord that a donor family donated a heart for him on November 28,2016. His dad live long enough to see this miracle given to us. His medication for his blood pressure has been change a couple of time and pray that he has a healthy life style. Thank you for your prayers and donation. On 2/28/17 it will be our three month anniversary. Consider becoming a organ donor. Nehemiah’s dad Samuel died on 12/22/16, please pray for the family. We will be traveling to Kansas City soon. Nehemiah is at home but is under the care of the heart team in Kansas City Missouri. We have to travel for the first month weekly for weekly biopsies. Starting January 2017 we will travel to and from Kansas City twice of month, spending over night because his appointments are early in the mornings. Thank each of you for your prayers concerns and donations. Nehemiah had the heart transplant on 11/28/16. Today is 11/12/16 he is out of the ICU and on the floor. The waiting period for a heart is over Thank God! The road ahead adds a new chapter for traveling weekly to and from Kansas City as he has to have weekly Biopsies. After this we will be traveling to and from Kansas City for a year. Donations will be needed and we thank you in advance for your prayers and monetary contributions to this fund. Thanks to each of you that recently donated we appreciate you and your gift of love. Nehemiah received his new heart on November 28, 2016. He is in recovery this morning at Saint Lukes Heart Insitute. The next step after recovery is for us, will be traveling once a week to Kansas for a month.